Each work is a meditation on exploration, the past found in the present, and is a critical discourse of technology and our persistent tendencies to open Pandora’s Box. 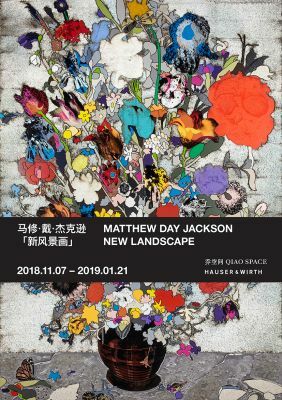 Born in Panorama City, California, in 1974 and currently living and working in New York City, Matthew Day Jackson’s multifaceted practice encompasses sculpture, painting, collage, photography, drawing, video, performance, and installation. His work grapples with ideas such as the evolution of human thought, the fatal attraction of the frontier, and the faith that man places in technological advancement. Using the world around him – scorched wood, molten lead, mother-of-pearl, precious metals, Formica, and found objects such as worn T-shirts, prosthetic limbs, axe handles, and posters – Jackson explores the forces of creation, growth, transcendence, and death through visions of its failed utopia. The most recent paintings on view are floral still lifes – direct references to the flower paintings made by Flemish Baroque painters Jan Brueghel the Elder and Jan Brueghel the Younger during the 16th and 17th centuries, when the Dutch Republic was reaching its height of colonial expansion. While the artworks from this period proudly demonstrated great wealth, the bouquets were in fact fantasies: none of those flowers could have grown in the same season or climate. Underneath the beauty of these gilded works lie clues of decay and destruction, foreshadowing global trade that exists today. Jackson’s paintings delve below the surface to reveal a certain truth: Jackson signals the pitfalls of the ceaseless misuse and abuse of the natural world through the greed of scientific and technological advancement. The essence of Jackson’s work resonates with metaphor, combining apocalyptic elements with the fruits of new technologies, and historical imagery with contemporary ingredients. Ideas are granted physical form, and it is in the clash between the two, in the material impact of idealist thought, that it derives its force. Persistent throughout Jackson’s oeuvre is the examination of human relationship with nature, and the inescapable repercussions of history and tradition, which have lasting impact today.